We are also provided Admission Support for 10th,12th,BA,B.com,BCA,MA,Mcom,MCA, BBA,MBA etc. & Examination Support like Sample Papers of NIOS board for (10th and 12th Class) students. You Can Get it Within 5 Minuit Anywhere in the World (e-copy). Sample Papers (including Last Three Year Solved Question Papers & Important question/Expected question with Solution)for preparation of examination, 10th & 12th class students only for NIOS Students. > During your course of study, internal assessment will be done to inform your progress through Tutor Marked Assignments (TMAs). 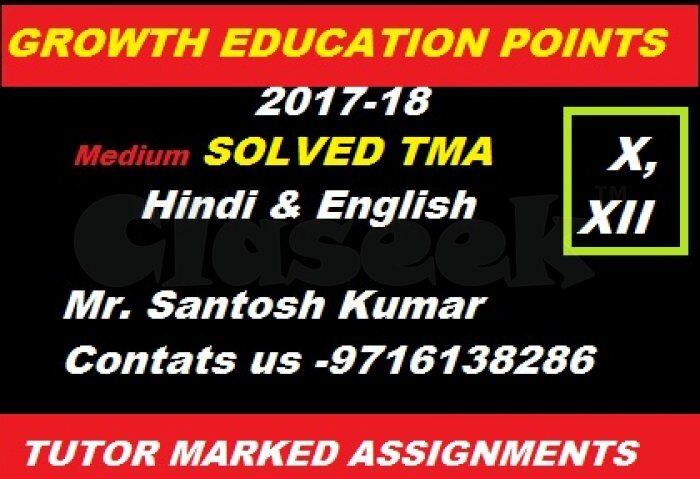 >TMA in Secondary/Senior examination will carry 20% weightage of theory as continuous and comprehensive evaluation. > Marks will be shown in the mark-sheet alongwith the marks of external examination which will carry 80% weightage in each subject. > TMAs help learners to know their progress and attainment level and develop regular study habits. > TMA should be submitted before appearing in the Public Examination of the particular subject. NOTE:Do not pay any additional amount for submitting TMA at Study Centre. We are a group of professional willing to help Professional/ Academic students, who generally fighting with time to prepare for further studies.